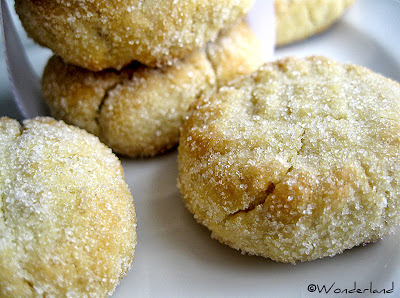 I know what you are thinking: "Mayonnaise in cookies?! Are you crazy?" The mayonnaise gives a nice taste to the cookies, without tasting too much of mayo. Which is tricky to explain, but it is true! You just have to try for yourself. 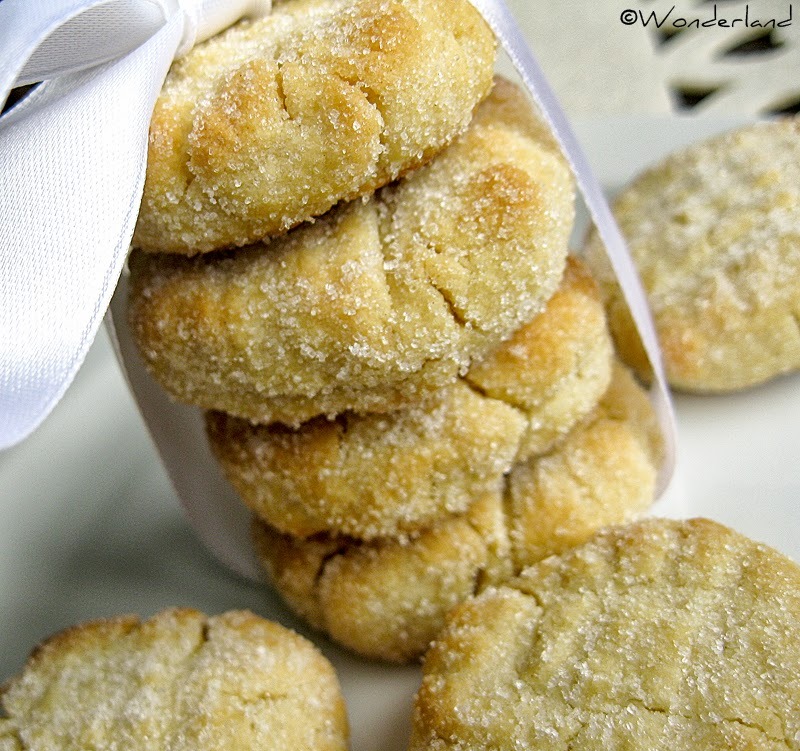 These cookies are very delicate, fragrant and buttery and they are lovely with a nice cup of tea. I found the recipe on this italian food blog. 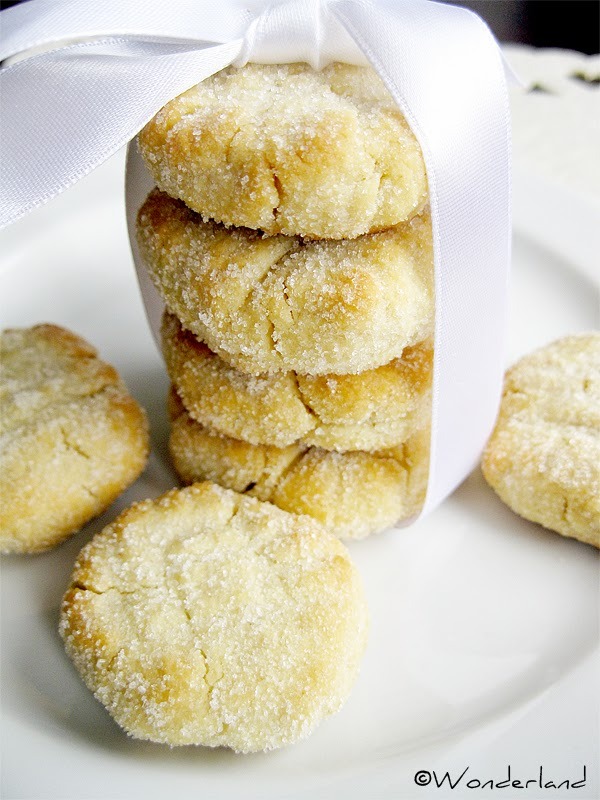 The mayonnaise cookies are also perfect as home made yummy presents for your friends! Just wrap them nicely with a ribbon or put them into a transparent bag or glass jar. NOTE: You will most likely need an electric mixer for the first part of the baking process! 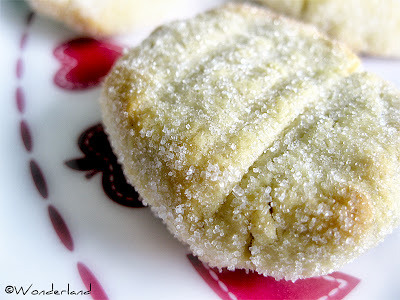 NOTE: The dough of these cookies is very soft and crumbles easily, so its consistency is not suitable for cookie cutters. Cut the cold butter into small pieces so it will be easier to work. With the electric mixer mix the butter with the sugar for about five minutes, until it turns into a soft cream. Add the mayonnaise, mixing now with spatula or spoon. Then add the flour little by little, always mixing at first with the spatula and later with your hands when the dough becomes harder. Add a tablespoon more of flour if needed, the dough must be soft but not sticky. Wrap the dough in plastic film and let it rest in the refrigerator for at least 30 minutes. Cover a baking tray with parchment paper. Preheat the oven at 190º C (374º F). From the dough shape small cylinders or balls (golf ball size), flatten them between your palms and (if you want) make incisions on the cookies surface with a fork like I did. Cover the cookies with sugar and place them on the baking sheet. Bake for about 12-13 minutes. Check their color: when they edges get a little brown and the cookies a little golden color, they are ready! Remove from the oven, but do not touch them until they have cooled down because they are very fragile.